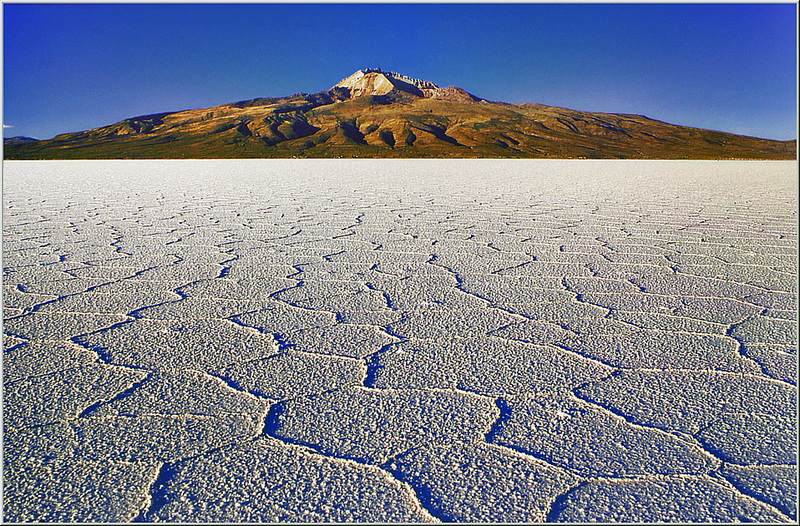 "Exploration in 4WD across the highest deserts of the world: Sajama, Lauca, Uyuni and San Pedro de Atacama"
Smoky volcanoes rise over colorful deserts which is not as desert as it seems because human settlements (Chipayas, Carangas and Chinchorros) live there since thousands of years. All of this, makes this unmissable trip feel like an “austral Tibet” . 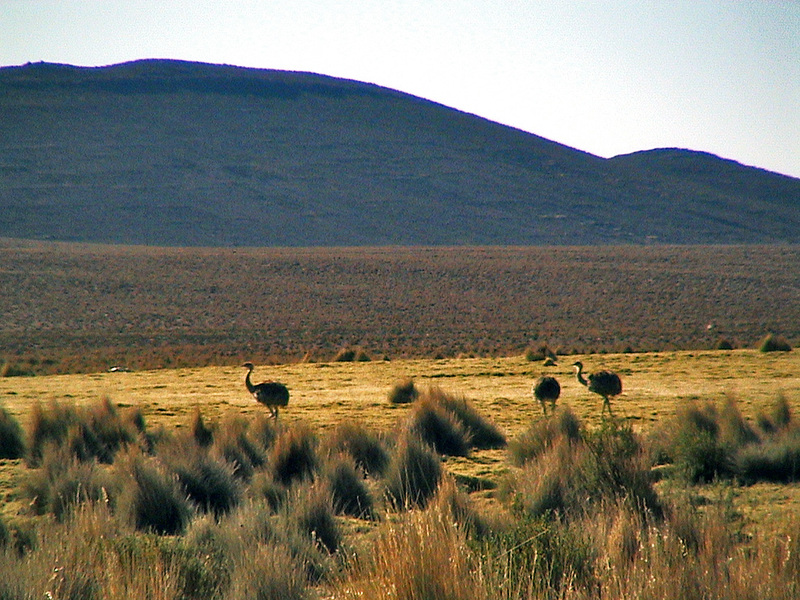 It is home to a rare range of wildlife including pumas, huemules, viscachas, vicuñas, guanacos, rheas and tattoos. The microclimates give birth to the endemic types of polylepis trees and lepidophyllum bushes which form the highest forest of the world. We will move from La Paz in 4X4 cars fully equipped. Before setting off on the trip, we will acclimatize a bit beside the fabulous Lake Titikaka. 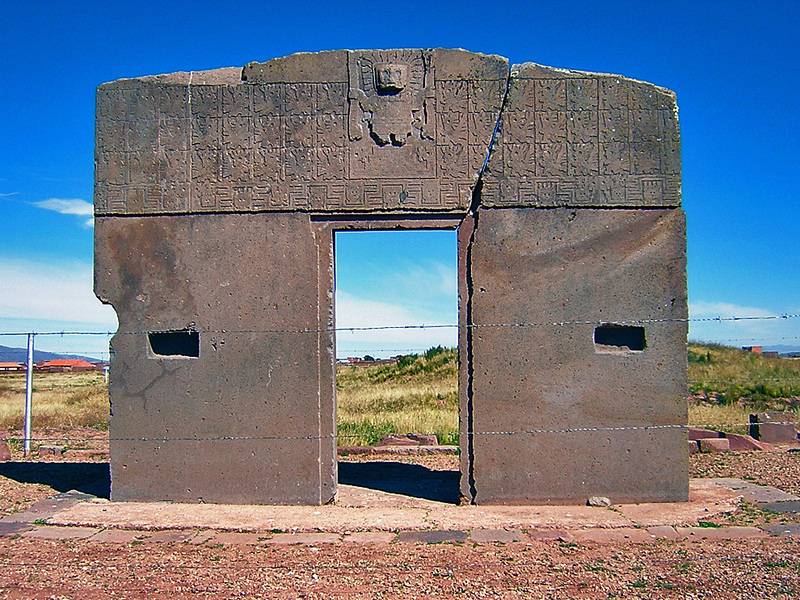 DAY 2: VISIT TIWANAKU & DRIVE TO COPACABANA CITY. 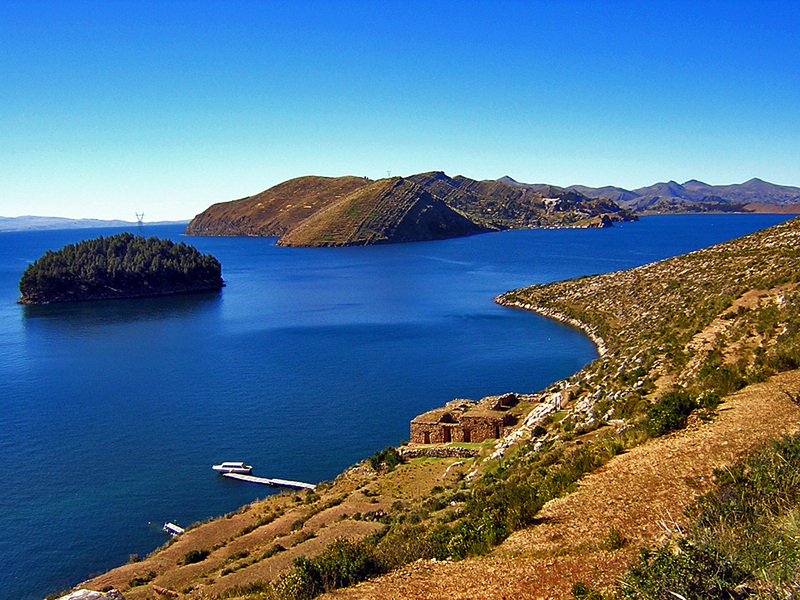 Drive to visit Pre-Inca temples and palaces and continue to Copacabana. Hotel. DAY 3: TOUR TO LAKE TITIKAKA. By boat we will get to Sun Island to find unique traditions and folklore. Return to Copacabana. Hotel. DAY 4: RETURN TO LA PAZ. Walk through indigenous markets, streets and viewpoints. Transfer to LP. Hotel. DAY 5: SAJAMA. Visit of Pre-Inca remains, hike in lava flow canyons. Hotel. DAY 6: PARINACOTA & PUTRE. Cross to Chile. 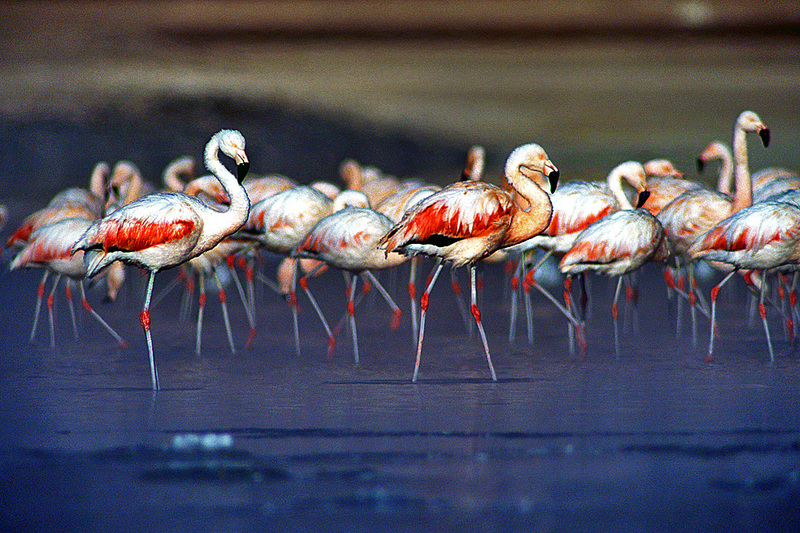 View birdlife at Lake Chungara and Lake Cotacotani. Hotel. DAY 7: SURIRE. 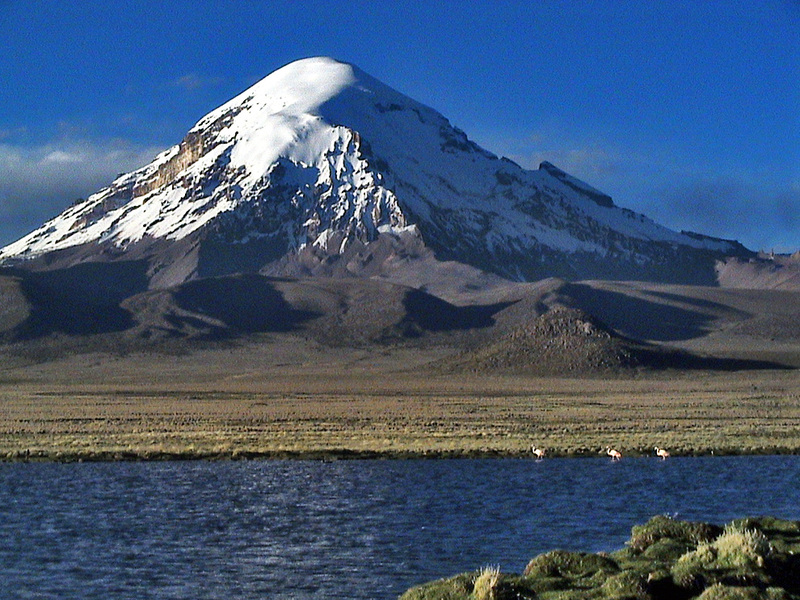 Enter the Lauca desert. Hot springs at the salt flat of Surire. Hut lodge. DAY 8: COLCHANE: Walk by forest of Keñuas. The best rustic Andean churches. Lodge. DAY 9: TAHUA. Cross to Bolivia. 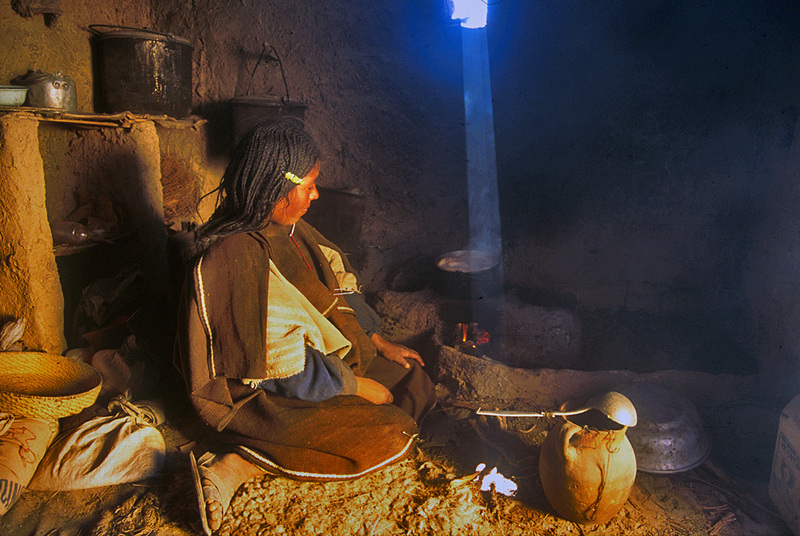 Remote desert and hamlets with great folklore. Traverse of salt flats. Hotel. DAY 11: QUEMES. Incawasi island and its giant cactus. Transfer to Quemes. Hotel. DAY 12: CLIMB TO IRRUPUTUNCU VOLCANO. 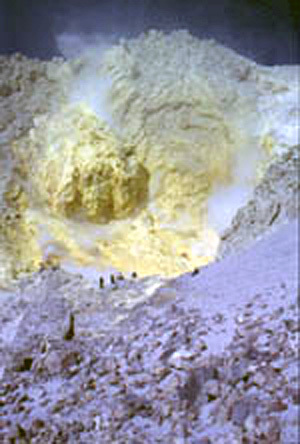 Impressive visit to an active crater. DAY 13: QUETENA CHICO VILLAGE. Canyons in lava flows. Lodge. DAY 14: CLIMB TO UTURUNCU MOUNTAIN & TRANSFER TU SILOLI. 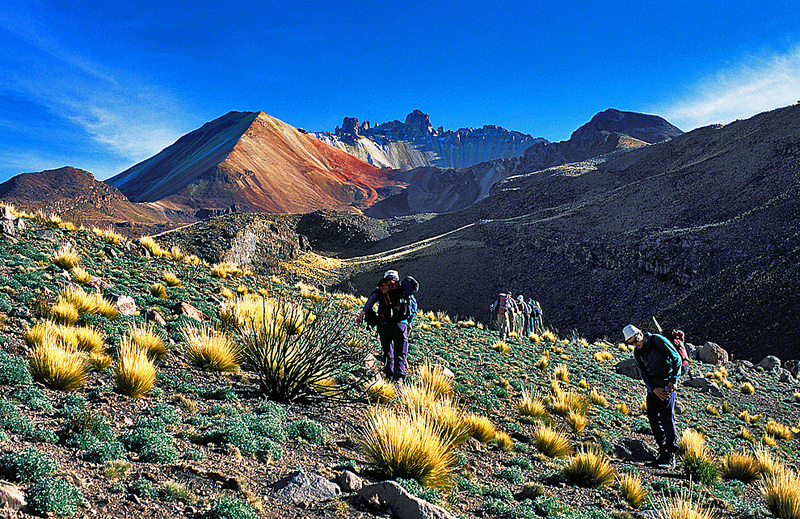 Climb the easiest 6000 meter peak in South America. View rupestrian paintings, Laguna Colorada and the desert of Siloli. Hotel. DAY 15: LAGOON VERDE- GEYSERS OF SOL DE MAÑANA AND SAN PEDRO DE ATACAMA. Visit geysers in Sol de Mañana , Laguna Verde and transfer to San Pedro de Atacama. Hotel. DAY 16: TOUR MOON VALLEY. Visit the Valley of Dinosaurs, Valley of Deaths and the eroded and Aeolian formations in the Moon Valley. 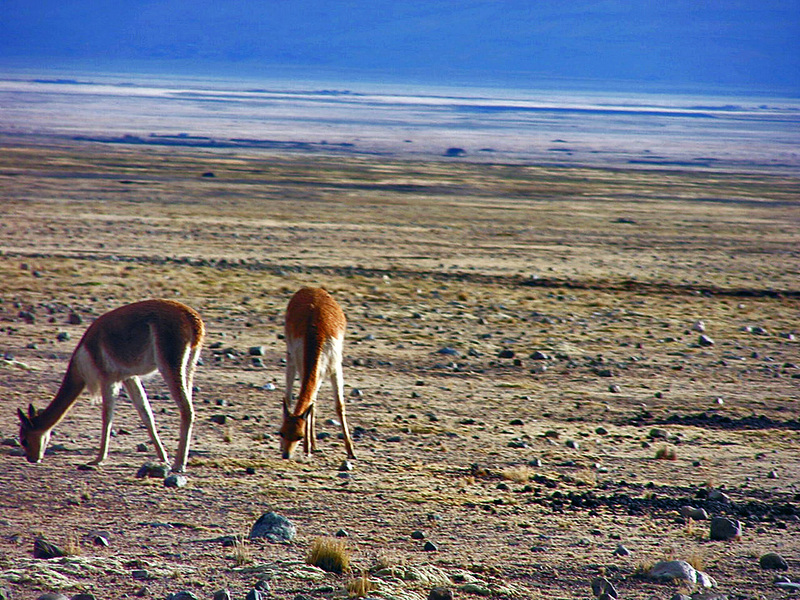 DAY 17: ATACAMA-CALAMA-SANTIAGO. Transfer to Calama for flight to Santiago. Reception in Santiago for final fly home. BRING: anorak, sleeping bag, warm gloves, polar jacket, down jacket, thermal underwear, sun glasses, head torch, sun block, sun hat, bathing suit, woolen bonnet, vaccinations card.